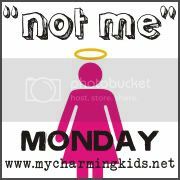 This fun little blog carnival is from MckMama - learn all about my Not Me's! then head on over to her page, check out hers, and the HUGE list of others! I have NOT been so busy folding last weeks laundry, and getting ready for Thanksgiving, and cleaning carpets and rearranging furniture so hopefully I can get the tree out, and entering 45+ Avon orders for a fundraiser I'm handling, that I have failed miserably at having any good Not Me! fodder! I'm kind of sad about it, really. But as my reward for getting the orders entered, I'll let myself go read lots and lots of you guys' Not Me!'s! Keep your eyes peeled for tomorrow, though- I'm partnering up with Julia from Sweet As Punkin Pie again, per your requests! Only this time, we'll be answering YOUR questions! Ohhhh....what are you teaming up for? I swear I've been living under a darn rock here lately! ;-( When there's tons of updating to do on the blog (per the aftermath of having it updated by a designer) that cuts into my blog reading time too much!!!! Trying to catch up! Argh, don't you have blog-writers-block? I have resorted to keeping a note pad at my bedside, so that when an idea strikes me, I can just jot it down. The question is, why don't I do that for my actual paying job??? I didn't keep any of them in the memory bank either. So, no MckMama post for me either today. Ah well. Next time.